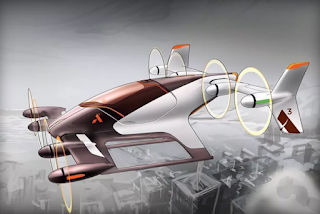 Airbus has announced its plans enter the vertical takeoff and landing (VTOL) aircraft market by 2020, showcasing a bold new design for a plane being created under the name Vahana. Vahana marks the first major venture of A³ (which Airbus pronounces as A-cubed). It's the Silicon Valley outpost of the European aerospace giant. In a Medium post, A³ CEO Rodin Lysaoff describes a plane built for a single passenger that "doesn't need a runway, is self-piloted, and can automatically detect and avoid obstacles and other aircraft." Airbus has already completed the design, which looks like helicopter chopped in half with eight rotors on two wings. The wings could tilt, allowing for the plane to move around both vertically and horizontally.